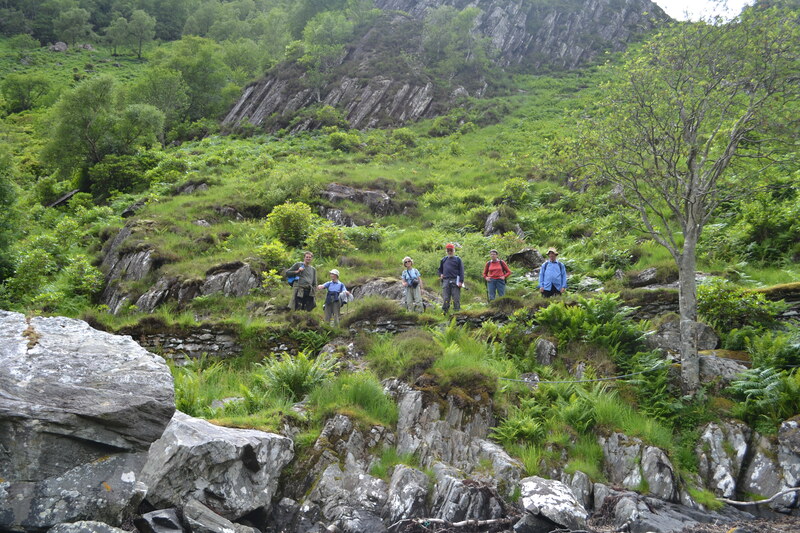 The now the familiar road to Kinloch Hourn was a great introduction to the walk led by John Wombell on the 29th June. Henry Birkbeck has always been very generous to NOSAS and once again he offered us the use of the Lodge for the whole weekend. Please don’t get me wrong: the camp site by the riverside is perfectly acceptable but it was much more comfortable and midge free in the Lodge. What resulted was an extended long weekend which turned into a typical KLH event and my apologies to those who were unable to attend but you missed a very good time. The Lodge is self-sufficient with its own water supply which also runs the hydro-electric scheme providing all the electricity for the house. The weather was glorious and had been for some time, and the absence of rain meant that the burn was very low. This resulted in much hilarity as we discussed the various water economies we could employ. Bath sharing suggestions of course produced much nonsense but with a great deal of care we avoided that by just staying dirty! We did get dirty when we spent the Saturday doing garden duties: the ladies dug out the steps to the hydro dam. These were threatening to disappear in the lush undergrowth but are now clear and ready to provide safe passage for another few years. The gentlemen spend a happy few hours playing with a gate, an engine and a culvert. In the afternoon we went for a nostalgic walk along to the viewpoint to sit overlooking the narrows for a while until the midges drove us back to the Lodge. Sunday dawned sunny and hot again and we were joined by Hector and his wife and James and set off round the garden. 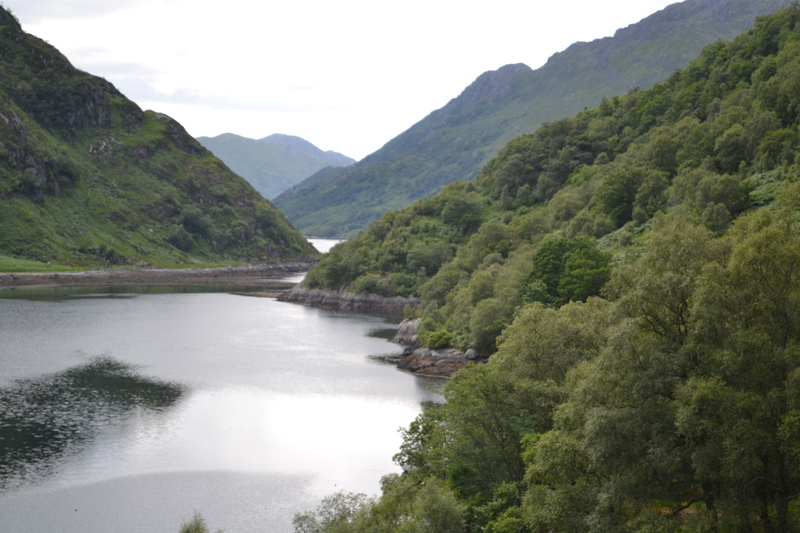 The garden at Kinloch Hourn was planted in the late 1800s and early 1900s and like so many lodges on the west coast of Scotland was extensive and gave an opportunity to plant the new ‘exotic’ plants arriving in Britain at that time. Rhododendrons predominated and as we now know the use of R. ponticum was a mistake, a bad mistake. By the time the Wombells arrived a ?? number of years ago there was no real garden – just a vast sea of ponticum. Over the intervening years with the help of a ‘garden team’ and now more specialist help the garden is being once more revealed without the rhodies. John, Trina and Graham Tuley guided us round the garden and although I have visited the Lodge several times over the years it was still amazing to see the changes in the last couple of years. Graham was full of knowledge and information about the rare and unusual trees and Trina added a lighter note describing the many pits she had fallen into over the years. After the garden we walked along the north side of the river, seeing a small site we had excavated now under bracken, and on to the bridge where we had lunch. Then a visit to see the remains of the oldest creel house sites at Loch Hournhead which we found during the early surveys. We discovered new sites we had missed the first time round. Mind you, the conditions were very different! Instead of the wall to wall rain we had in 2006, this time we had wall to wall sunshine. Next was a quick look inside the steadings at Loch Hourn Head where the cobbles form interesting patterns. When we have visited in the past the gates have been shut but were open this time as the café was open for the summer. unseen boat landing with a possible winter naust, and we didn’t have the excuse of bad weather, we just had never seen it. But it is now recorded and added to the list. Finally we reached Skiary and walked round reminiscing on previous visits and noting changes and explaining it all to James. 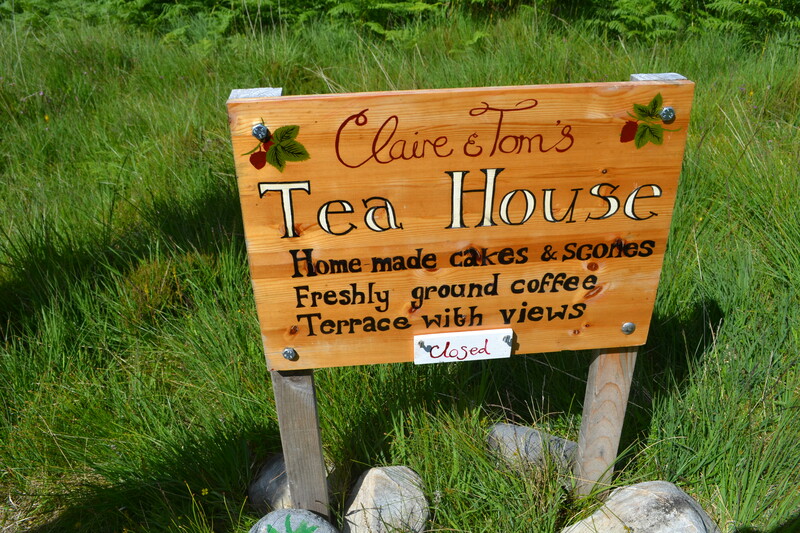 In our day they didn’t do Strawberry Teas at Skiary and even on the day of our visit the folk were busy elsewhere so we weren’t in luck. Our thanks go to John for organising the walk, Trina and Graham Tuley for the informative walk round the garden and of course to Henry Birkbeck for allowing us to use the Lodge and visit his land. This entry was posted in General Archaeology, Lochaber, Post Medieval, Surveying and Recording and tagged archaeology, archaeology Scotland, Barrisdale, creel houses, Kinloch Hourn, Knoydart, Loch Hourn, naust, North of Scotland Archaeological Society, NOSAS, recording and surveying, Scottish archaeology, Skiary, steadings on September 11, 2014 by nosas.